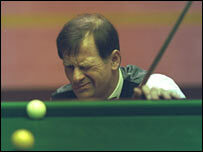 Two-time world snooker champion Alex Higgins attacked a referee at a charity match in County Durham on Monday night. The exhibition fund-raiser at a leisure centre in Spennymoor, pitted Higgins, 58, against Jimmy White. But proceedings ended in chaos when referee Terry Riley refused to carry on after he was punched in the stomach. Higgins snapped when Riley called a foul and had to be restrained by fans, although Durham Police later said no reports of assault had been received. Class one international referee Riley told the Northern Echo newspaper: "It was a punch and officials are not there to be punched. "He just came at me and punched me in the stomach - that was when I pushed him away." But Higgins told reporters on Tuesday that the row had been "blown out of all proportion". The snooker legend appeared at a signing in a Newcastle bookshop wearing his trademark Fedora hat, jeans, a woolly jumper and a silk scarf. "We were both out of order," added Higgins. Reporters were then thrown out of the shop and the promoter of last night's exhibition match refused to comment. Higgins was signing 'From The Eye of the Hurricane' - his new autobiography. Monday's charity match was organised to raise money for local players and the event's promoter has since told BBC Radio Five Live that Higgins only brushed against Riley and did not punch him. In 1986, the Belfast-born Higgins earned a year-long ban for head-butting a match official, and he has had numerous scrapes with the snooker authorities in his long career. He also continues to battle throat cancer.